Alternatively send us your enquiry via email and we will get back to you as soon as possible! We provide Damp Proof Course injection, DPC, DPM, Chemical Injection (Dryzone Dry Rods), Structural Waterproofing, Vandex Slurry Tanking and Membrane Damp Proofing Systems across the Shrewsbury and Shropshire area. At Conifer we take pride in being an approachable damp proofing company trading on the traditional values of customer service, reliability and quality of work. We have helped many, many people in Shrewsbury and the Greater Shropshire area with myriad damp proofing issues. Our projects are properly supervised and as much care is taken in the initial protection of the working areas as in the completed works. Our damp survey reports and plans are clear and detailed and are used to indicate areas of work, and the type of works proposed. The reputation we hold is built not only on the quality of our surveys and work but also on the honesty of our reports. Our advice is always honest and based on our similar experience with damp proofing Shrewsbury and Shroshire projects. Conifer work closely with the manufacturers of the waterproofing products to make sure that, whether chemical injection DPC or full basement conversion, you only get the products your property needs. 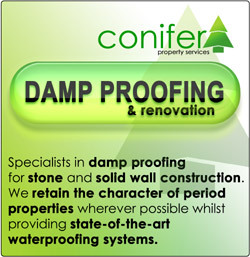 At Conifer we are damp proofing specialists, we take pride in our work around the Shrewsbury area. Your property will be treated with respect in all aspects of our work. By scheduling the work properly, we endeavour to keep the disruption to a minimum. Vitally, we believe that knowledge and experience have to go hand in hand and, with the best will in the world, there is a difference between specifying the materials and actually using them in various working environments. It is most likely that the surveyor who visits your property will form part of the work team that undertakes your project - we are totally 'hands on'!